Fearful of a relentless downward slide, Cairo’s middle classes generate income by renting out their private apartments for the illegal filming of TV soaps. Cairo, Egypt. Picture by Rutger / Flickr.com (CC BY 2.0). Some rights reserved. What are the socio-economic forces and tensions in play – and the competition Cairo’s middle classes face from the super-rich denizens of luxury villas in the secure, gated communities springing up around the city? Coming home one May afternoon to my venerable Cairo apartment block, I find the faded elegance of its shabby foyer and central staircase suddenly transformed into the final scene of Sunset Boulevard, with a full film crew and camera lights, all switched on as if ready to capture Gloria Swanson’s famous final descent declaring herself “ready for her close-up”. The main entrance is crammed with metres of thick cables, arc lights of all shapes and sizes, cameras and other pieces of film equipment – with a dozen able-bodied men in flip-flops barring access to the site. Residents who are stranded outside inspect the litter – a messy jumble of takeaway paper bags, soft drink cans, and empty water bottles - strewn around the crew’s three lorries parked in the narrow street, each packed full of yet more equipment. Their noisy cries of “fi ehhhhh?’ (“What the hell’s all this then?” with the final vowel drawn out to signal irritation) are parried robustly with the single word ‘taswir – tasssssswiiiir - taswirrrrrrrrrr’ (“filming” – repeated with increasing elongation). The buzz, excitement and incipient chaos is suddenly stilled as the director’s loud call of ”Klakit... take....... ACTION!’ resolves the tensions of the set into some semblance of order, and triggers a silent, magical moment of anticipation. It turns out that one of the upper floor flats in the block has been rented out for location filming of a forthcoming “Ramadan soap” – one of the many lavish TV serials made especially for nightly screening over the Muslim holy month of Ramadan, when audience expectations and numbers are at their peak. Over the following days, my fellow residents grow steadily more hostile towards the filming project that appears to have taken over our lives, without even the consolation of any clear deadline in sight. We become hostages in our own homes, as neighbours are forced to park their cars streets away and walk home in the blazing summer temperatures, home deliveries are delayed until unreasonable hours, and even our late nights are not spared loud hammering from the garden as the crew installs large metal gantries needed to shoot a violent love scene (an increasingly common component of soap opera content) on the upper floor balcony. Given the neighbours’ disapproval, I was intrigued by my neighbour’s decision to ‘monetise’ his private residence by publicly renting his flat out for use by commercial film crews. All the more so since Egyptian culture is well known for its rigid differentiation between private spaces (lovingly furnished, cleaned, and maintained) and public, shared spaces (generally treated with indifference). The tension between the external ‘pull factors’ inducements attracting him and the intrinsic ‘push factors’ driving him to strike such a Faustian bargain became a focus of the residents’ thoughts and discussions for weeks. The pull factors appear to be rooted in recent developments in the political economy of Egypt’s film and TV industry. Ever since the days of early black and white movies, Egypt has been known as one of the Arabic speaking world’s prime centres for film and TV production. Since the state socialism of Nasser’s revolution, the Egyptian government has controlled media production and distribution, and so gained not only political advantages, but also significant commercial returns. During the Mubarak era the government made a multimillion-Pound investment in a new, hi-tech, state of the art Media City in the trendy 6th of October district of Cairo. But as Egypt’s dominance over Arabic TV productions came under increasingly significant threat - cultural/political as well as economic - from imported, dubbed soap operas (firstly from Syria, then Turkey, India and most recently even South Korea) the new Media City’s exorbitant daily charges for filming, exacerbated by long waiting lists caused by cumbersome bureaucratic/political approval and permit procedures soon led to the spontaneous emergence of a thriving informal film production industry widely known as the bir il-silim (below the stairs) underground. Sourcing cheaper, more flexible locations is a key requirement for bir il-silim filming of soaps and other TV productions – and it soon became clear to me that the area in which my flat is located, the Heliopolis district in northern Cairo, has for them at least two prime attractions. The first, tangible benefit is strictly spatial. 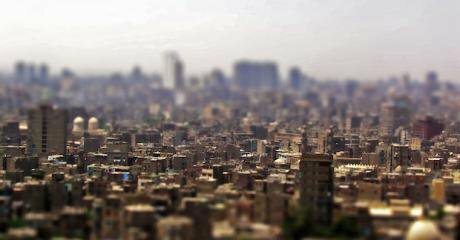 Modern Cairo is a notoriously congested and cluttered city, with families crammed into small apartments and dwellings. By contrast, the neo-classical architectural heritage of Heliopolis’ apartment blocks blesses them with wide corridors, high ceilings and spacious rooms, often divided by elegant French windows – all ideal for setting up equipment and location shooting. The second advantage, which is more intangible but at least as important, is Heliopolis’s distinctive cachet combing “heritage zone” prestige with the chic of what is widely perceived to be a lucrative hive of ‘out of the ordinary’ cultural and economic activity. When sourcing locations in which to exploit its niche advantages, the bir il-silim sector relies on a close-knit network of agents who possess information, access, and networks within the underground – and unregulated - private rental market. In my area, the entire neighbourhood knows Hamasa – the highly regarded local ‘Mister Fix-it’. These days almost everybody who has direct personal dealings with Hamasa finds themselves rapidly won over by his likeable character and helpful approach – my neighbours repeatedly refer to him with the heart-warming words of ishta (cream) and fola (jasmine), usually accompanied by the blowing of kisses many Egyptians are in the habit of doing to show affection. In his trendy jeans, and with his three state-of-the-art mobiles ringing simultaneously at any time of the day, Hamasa possesses an innate fahlawi (street-wise) mix of resilience, charm and low cunning enabling him to get things done quickly, however dodgy his methods, and to pay and get paid on time. These features are important survival measures in an illicit industry that needs to avoid any reports of wrongdoing reaching the authorities. Starting out as a simple fakahani (seller of vegetables and fruit from a stall in the local souq), Hamasa was headhunted to be the right-hand man for a key player in the same profession he himself now personifies, Saber, who was beginning a prison sentence for embezzlement. Saber’s stratagems to prevent his wheeler-dealing business from going under, even while he himself is locked up, have given Hamasa a more elevated and powerful profile in the neighbourhood. His breakthrough from humble roots to the glamorous world of media celebrities may sound like the stuff of fairy tales, but his success in the role shows that Saber has evidently chosen carefully. Hamasa’s most lucrative Heliopolis rentals are two ground floor flats, long something of a local landmark and just across from where I live, which are owned by twin siblings. When I pay Hussein a visit, I find that his flat has been subjected to a complete makeover, so that it now projects a ‘state-of-the-art’ ambience. Low slung metal-and-brown-leather furniture, potted plants, and black and white ceramics are displayed against a backdrop of reproductions of paintings brought from the museums of Paris and Vienna. Hussein tells me that many of his design ideas have been inspired by American TV thrillers and political serials such as The West Wing (2006), the aim being to make a viewer feel that he is “in the middle of Manhattan”. The makeover approach has also been taken up by his twin sister Salma, who, in complete contrast, has transformed her flat into the set for a monarchical Egyptian palace of the 1930s. Its salon is furnished with mock Gothic wooden throne style chairs, the dining room with a long, highly polished belle époque table surrounded by elegant doree (gilded) chairs, with the whole premises decorated with opulent chandeliers, larger than life wall mirrors, heavy brocade curtains, and numerous extravagant objects d’art. As I am taken on a tour, Salma pauses to highlight the connoisseurship that has gone into the selection of each item on display. Many acquisitions have come from the auction houses and antique markets which she frequents on a regular basis. Her luqat (one- off bargain ‘finds’), obtained at next-to-nothing prices, are then refurbished and presented as ‘originals’, with the collection regularly rotated to meet the differing needs of successive film crews. Her new-found knack for searching out rare period pieces has, in addition, allowed Salma to make something of a name for herself as an interior designer in her own right. She has found that many of her acquisitions, as soon as they are seen on a TV broadcast, become highly sought after by the new wealthy elite, who are in the habit of declaring them, immediately after purchase, as their own family heirlooms. Both twins have lost count of the soaps, films, and talk show debates shot on location in their apartments, and see themselves as pioneers of a wholly new, lucrative self-employed lifestyle. The income generated by owners (or tenants) renting out their homes in this way is estimated to range from 8,000 to 10,000 LE a day: by contrast, in 2014 the Sisi Government set a maximum wage for state employees of 42,000 LE per month (equivalent to a daily income of £60). These levels of return enable renters to purchase other attractive locations within the vicinity and transform their interiors into seductive and viable new location options, thus consolidating their position in the production circuit. Yet although the increasingly cut-throat competition between bir il-silim filmmakers allows the residents of popular locations to demand ever higher rentals, Salma and Hussein tell me that Hamasa has been loudly complaining that filmmakers’ ever-tighter budgets are pushing him to seriously consider other more affordable locations which can meet the chaotic demands and deadlines of Ramadan soap shooting. Osman’s difficulties strike a deep chord with many middle-class families who sense that their current economic hardships might well, if not mitigated, in time see them reclassified among ‘the new poor’. Their fear is of a downward spiral to annihilation, a prospect made especially painful when compared to the security of wealthier families who have already moved to the sequestered and gated residential communities proliferating around Cairo’s desert fringes. Notwithstanding these common fears, there are nevertheless significant differences among the block’s residents, which stem from other deep running inequalities amongst them. A prime bone of contention, for example, relates to the fact that Osman is the only tenant who was previously in a promising enough financial position to take up the option of purchasing his flat from the company that owns the block. He is thus in a different league to tenants who continue to pay monthly rents. For while rents, originally controlled under the provisions of Nasser’s state socialism, can remain as low as LE 20 (i.e. less than £1) a month, their position as tenants is growing increasingly precarious as the company reviews their legal status under its current scheme for tahdith (literally ‘modernisation’, but with a wealth of sinister sub-texts). Their “continual poking into all their old legal dossiers and book-keeping records, searching for any grounds for making trouble”, as one neighbour described it to me, has made many tenants fearful of punitive eviction of anyone found to have any connection with dodgy filming work – especially since it is widely accepted that the company dispatches its spies to snoop around on a daily basis. At the least, this new surveillance of tenants’ practices could place them at a severe disadvantage within forthcoming changes expected to hit the housing market, potentially altering the system of rental controls in response to ‘market forces’. By contrast, owner-occupier Osman appears secure in terms of both the immediate and potential future returns of his bir il-silim filming project, as well as enviably immune to legal sanction by a rapacious landlord. The way in which Osman embarked on his filming project is nevertheless illustrative of how middle-class families, finding the gap suddenly widening between an economically fragile present and a yet more uncertain future, display an aversion to making long-term plans and investments, as well as a tendency to act impulsively when offers unexpectedly appear out of nowhere. So rather than channelling his efforts and leveraging his remaining resources and connections into rescuing his ceramics business, Osman instead grabbed the opportunity to plunge into the world of underground film-making. He was also entirely typical in seeking to camouflage his economic difficulties from the prying eyes of neighbours, his business associates and the wider world. His chosen stratagem for this was through the calculated move of delegating public management of his film-making contracts to his wife Zizi, thereby seeking to signal that filmmaking was merely ‘a side-line’ source of income. As she pauses to hand out contact details on her personal business cards, I am struck by how Zizi’s dramatic performance, each section carefully modulated for maximum effect on her audience, could almost be modelled on the heightened emotive registers favoured by the actors in the Ramadan soaps themselves. Yet it is striking that her subject matter – concerning the brute daily life realities of the struggling middle classes – is far removed from the actual content of any and all such productions, which are invariably period dramas from ‘another age’ (with no contemporary resonances), or whodunit/psychological crime thrillers without any social contextualisation. So if, on the face of things, the State is an absent partner in these bir il-silim productions, it is nevertheless evidently restricting permitted storylines to settings which are careful not to ask any of the big questions of the day, and from which any reference to the contentious real-life issues and problems discussed in endless TV talkshows can be forcibly excluded. And by converting their homes into the settings for these escapist productions, their middle classes residents are silent partners in keeping their worst anxieties temporarily at bay. Since 2016, when I did the fieldwork on which the above “ethnographic snapshot” is based, there have been further developments in the world of bir il-silim film making, which both stem from, and reflect, wider socio-economic currents. The most prestigious and successful of the following year’s crop of Ramadan soaps were notable for storylines even further removed from the day-to-day realities of life in contemporary Egypt, revolving instead around escapist gothic horror stories and crime thrillers – with even those series which still fell into the ‘social drama’ category locating their action in the type of super-affluent milieux more typical of western TV series such as Dynasty or Dallas. One immediate effect of this increasingly ‘westernised’ dimension has been a shift of focus towards what the bir il-silim film makers call “VIP locations” i.e. luxury villas located in walled and gated communities around the city to which the super-rich have retreated for enhanced security. Hamasa tells me that he is still able to make a living from renting the ‘respectable bourgeois’ apartments of Heliopolis out for the filming of assorted commercials and less prestigious TV programmes. But the income generated from such rentals is now dwarfed by that commanded by the new competitors in their gated villas, who can now charge between LE 20,000 -30,000 a day. And as the most affluent extract ever higher financial returns and further increase their assets, those below them in the pecking order find themselves caught up in an increasingly ferocious competition over ever smaller slices of the economic cake - developments which seem somehow characteristic of Egypt’s current socio-economic predicament.